Can Citic avoid the investment bank buyer’s curse? Can Citic avoid the investment bank buyers’ curse? The Chinese securities firm is paying $1.3 billion for Credit Agricole’s CLSA broker business. Avoiding another Dresdner/Wasserstein, Nomura/Lehman or Credit Suisse/DLJ would be hard for any bank – much less one controlled by the Beijing government. Arm’s length management alone is unlikely to make this deal different. As it is, the transaction is something of a Plan C for Citic’s global ambitions. The firm led by Wang Dongming nearly grabbed a chunk of Bear Stearns before the global financial crisis. Then it started talking to CLSA about a complex cross-investment arrangement. After two years of negotiations, it has reached this agreement, which should give it control. It may rue the day. That has been the experience of other, more experienced, global banks that have picked up rival firms they’d hoped would give them entrée to the Wall Street club. Nomura, for instance, in 2008 acquired the assets of Lehman Brothers in Europe and Asia. It failed to rank among the top ten equity issuers in Asia so far this year. At least Nomura didn’t pay much. Dresdner Bank spent $1.4 billion – not much less than CLSA’s costing – on Wasserstein Perella, a boutique mergers advisor. The rainmaker whose name adorned the firm’s door left within a year to run Lazard. Credit Suisse paid a whopping $14.7 billion for Donaldson Lufkin & Jenrette in 2000 only to watch its more enterprising bankers head for the exits. It’s hard to see how it will be different this time. Citic is controlled by a Chinese state enterprise. CLSA is a highly independent, research-based broker founded by a couple of expat Asia hands. Even with retention packages – and Nomura, Credit Suisse and Dresdner offered these in quantity – motivating CLSA employees is going to be extremely difficult. But maybe that doesn’t matter to Citic. It may think spending a little goodwill (anything above CLSA’s book value of around $800 million) is a small price to pay for a few years of top-notch research, a brand name that in fairness means something to institutional investors around the world and an operating presence in a handful of new markets. Then again, that’s the “Wall Street admission price” argument Dresdner spun when it bought Wasserstein. The bank disappeared in a fire-sale to Commerzbank a few years ago. Apparently the business school case study of the dumb German bank is not one taught in China. 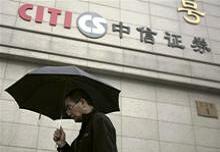 A man walks by the logo of CITIC Securities at a branch of the security brokerage house in Beijing. Credit Agricole has completed the sale of a 19.9 percent interest in CLSA, the pan-Asian brokerage, to Citics International, a subsidiary of Citic Securities, for $310 million in cash, the two companies said on July 20. At the same time, Credit Agricole has agreed to sell to Citics International the remaining 80.1 percent interest in CLSA for $942 million in cash. The companies said CLSA’s existing independent structure of the management team will be kept. Citics said the acquisition of CLSA will offer an international platform to better serve clients in China and globally. CLSA reported revenue of $739 million and loss attributable to shareholders of $10 million for 2011. Its total assets were $4.4 billion at the end of 2011. The deal was based on consideration of 1.6 times 2011 book value, according to a person close to the deal.